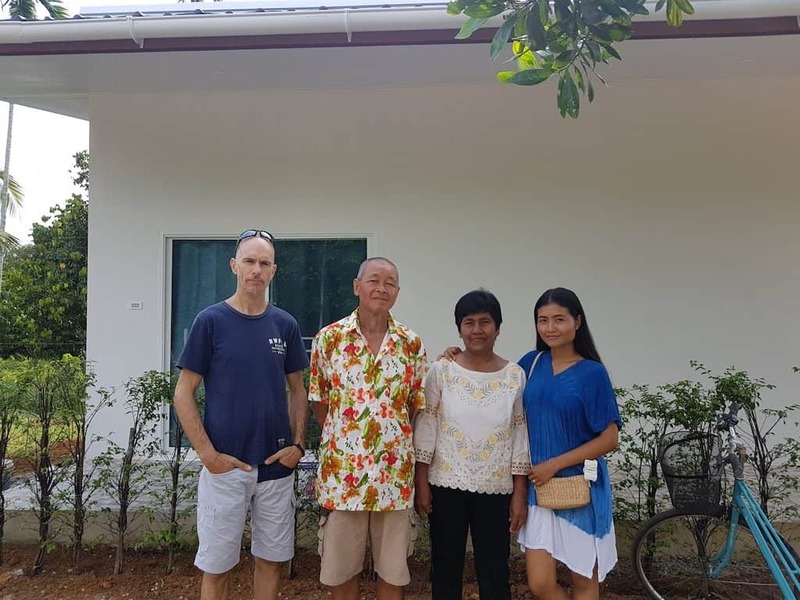 We’ve been building a one-bedroom Thai house for our Thai parents over the last 2 or three months and this week, they moved in. After their retirement they moved from Bangkok to Khon Kean in Isaan, Northern Thailand but really didn’t take to life up there. So we brought them down to Trat province. Unlike in the West where the family unit has been eroded by political will over the last four or five decades, here in Thailand it is still very much part of the cultural fabric and a way of life. We will be looking after them, and they will be looking after us. It’s a symbiotic relationship… that’s family! They are both very active and just like our parents back in England; it’s hard to slow them down (life begins after retirement). Fortunately they love to be outdoors and play in the garden. So they are lending their time and sharing a lifetime of gardening know how with us to get our permaculture food forest established. The 42 square meter Thai house has split sloping roofs, which due to the over hanging design provide a lot of shade to the house. This helps to keep it cool by providing lots of shade throughout the day. The roof also serves as a water harvesting system and we collect the rainwater in two large ongs on either side of the house. An ong is a large vase like vessel made from concrete designed to capture rainwater and keep it cool. The water capacity of an average ong is 1000 liters. 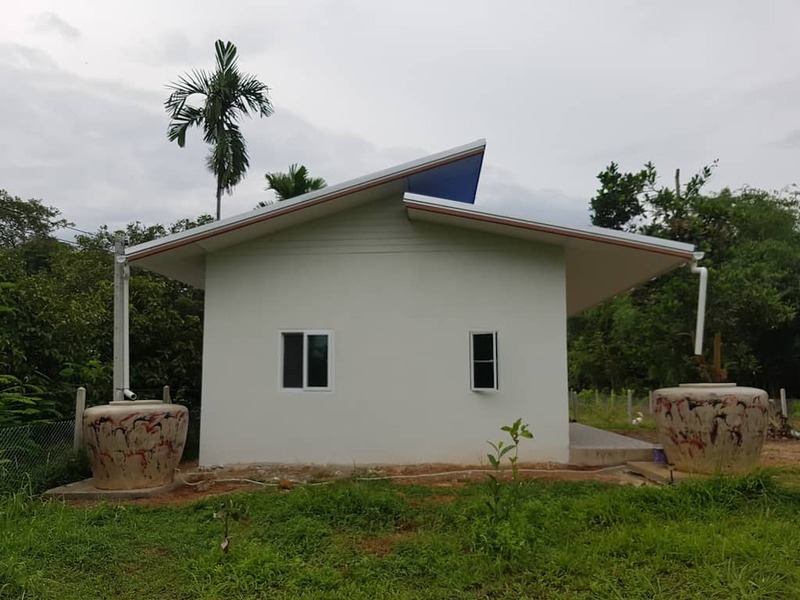 Each ong (we know have four across the property) is fitted with a tap so we can take water easily and distribute it among the trees by a hose or watering can. Also outside the Thai house we have another elevated water tank for government water in case we need it. Waste water goes to a septic tank on the edge of the property while grey water goes to another holding tank that will ultimately irrigate some freshly planted bananas and other fruit trees when needed in the dry season. As this is a traditional Thai house, the kitchen is located outside. Cooking outdoors keeps the smells and heat away from the house and if you have ever cooked spicy Thai food, you will know why. When we built our shipping container home we had all the windows and doors custom made. This was an enormous expense and an unnecessary one we didn’t want to repeat for the outlaws Thai house. So this time round we purchased ‘off-the-shelf’ uPVC windows and doors (with mosquito screens) from Global House. We’ve been to this retail store so many times during the course of the last year it feels like our home from home or Cheers Bar, where everyone knows your name! 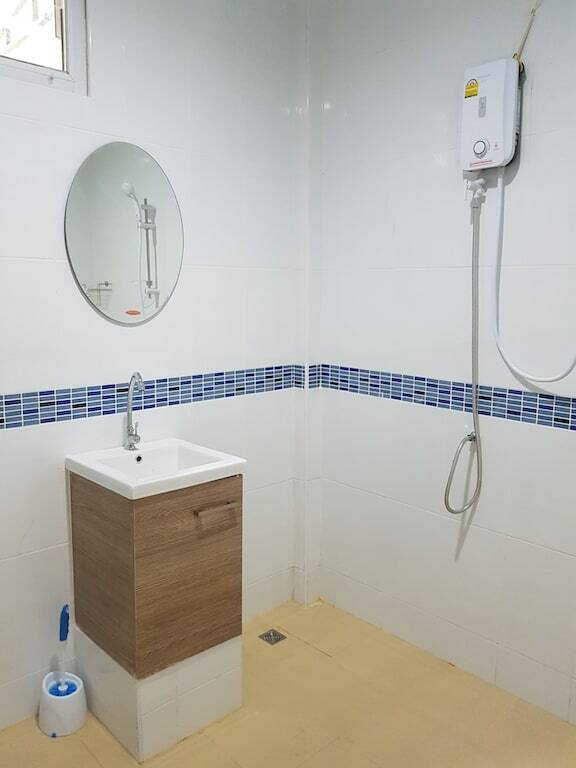 Inside the high ceiling house there is one large bedroom, a W/C wet room with all modern fixture and fittings by Morgan and a L-shaped living room. Originally we planned to have 2 bedrooms but decided it was a better use of the space to have no dividing wall and door. If our parents have guests to stay privacy can be obtained using a curtain or screen. 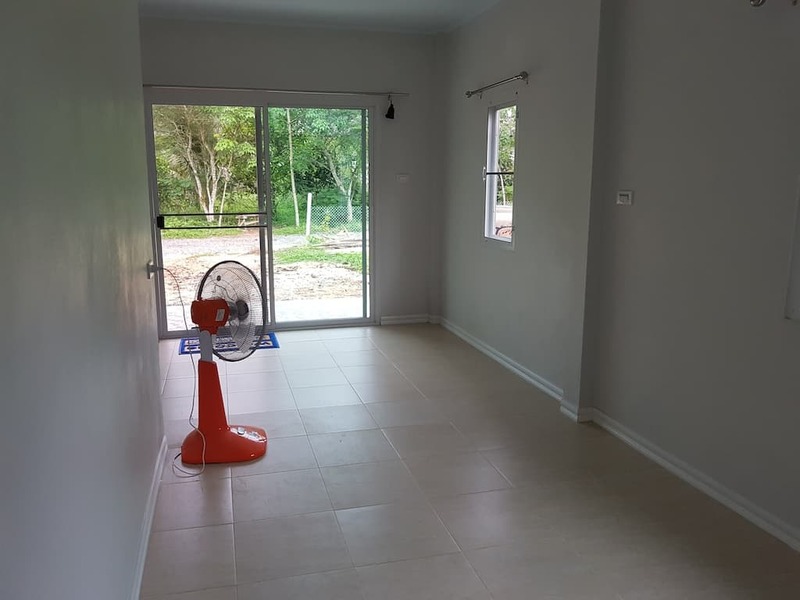 The house has no air-con but stays remarkable cool inside with a simple fan and good airflow from open windows. The house is very simple and we have kept a blue and white theme throughout. 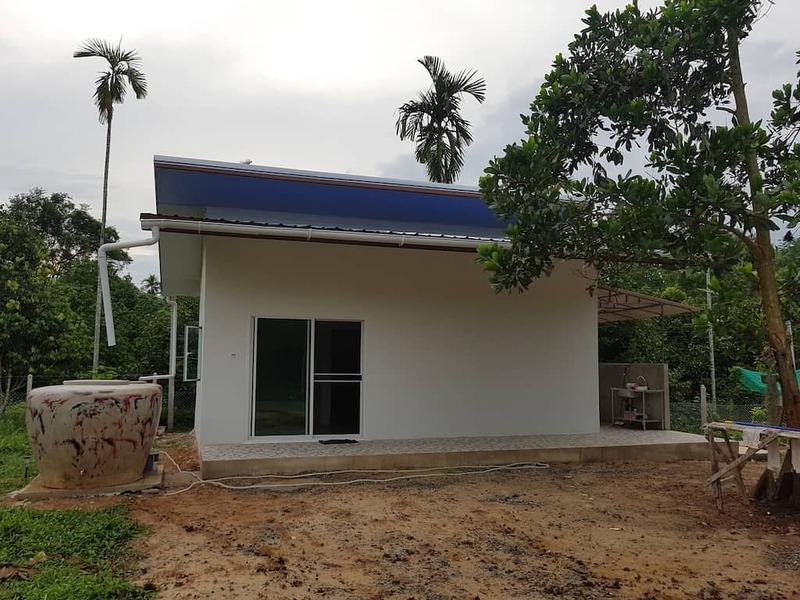 We built this house for around 400,000 THB and construction was around 80 days. The ground outside the house looks like a cleared building site, which is exactly what it is. The fun now starts for us to make it look beautiful. We will be first level out the land by buying a truck or two full of soil. Near the outdoor kitchen is the perfect spot for… you guessed it, a kitchen garden! We will use six concrete manaos (rings) just the same as our kitchen garden construction to get a growing area up in next to no time. We have a 3 meter poly tunnel to construct along the fence line. Inside we will be planting mainly tomatoes and cucumbers as we all, including the pets, eat these fruits and vegetables a lot. Behind the shade of the palm and the house we will be moving our three coffee plants as they have been getting roasted way ahead of time in the full sun. The rest of the garden will be planted out as a traditional Thai garden with a few Thinglish twists to provide lots of shade, color and pleasant aromas. It will be a mixture of citrus, pomegranate, orchids and a pong pong tree near the road with lots of beneficial flowers in between to provide a splash of vibrant colors and bee food. Now it’s time to get my sleeves rolled up, boots on and go dig around the new Thai house with my outlaws! If you dug this post, leave a comment below. Support us by shopping at our store here. You can also follow Thinglish Lifestyle for a life less ordinary on Facebook, Instagram, Twitter and Youtube.